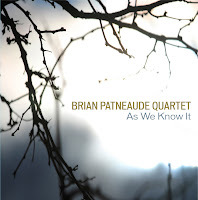 Brian Patneaude is a saxophonist and composer based in upstate New York, this is his third independently produced album, and he is accompanied by George Muscatello on guitar, Mike DelPrete on bass, Danny Whelchel on drums and Dave Payette on electric piano. This group has been together a long time and it shows in the tight interplay the musicians achieve throughout the disc. Patneaude solos with strength and confidence throughout the CD on material ranging from ballads to electric-Miles influenced funk. The first few songs begin the disc with a strong mid-tempo groove with the opening “Matters Not” developing a very memorable melody and saxophone improvisation, and “Exit” featuring a cool and muted guitar solo. “Will You Be” has a nice pastel toned fender Rhodes interlude and a fine bass solo, while “Simple Truth” slows things down to a more peaceful tempo with a meditative tenor saxophone solo. “Majority” returns to a higher gear with a mischievous melody and round-robin soloing. “Life As We Know It” has a moodier and more atmospheric feel, while the final track “Gil Barney (Wins the Race) revs up into a bar walking funk workout complete with Pete Cosey-like wah-wah guitar. This band is a very adept working unit, performing memorable original compositions and comfortable at any tempo that they choose to perform, making this a consistently good album of modern jazz.